Sure there are a TON of kitten videos out there on the interwebs. But there’s only ONE Miracle Kitten Cassidy. Cassidy is as cute as a darn button. He will make you crinkle up your eyes and let out an involuntary “Awwwww” the moment you see him. But, make no mistake about it, Cassidy is a TOTAL bada*s.
Doubt me? Can’t believe that little fluff ball is anything but adorable? Well, wait until you hear what Cassidy managed to do. Kitten Cassidy says, “FU*K you bad luck! Cassidy was born in a feral cat colony, already a challenging way to start off life. But then tragedy struck as the little guy lost not one, but BOTH of his back legs shortly after birth. With things looking pretty darn grim… no back legs and living in the forest… what do you suppose Cassidy did? If you guessed that he gave up… bzzztt… wrong answer. Thank you for playing. 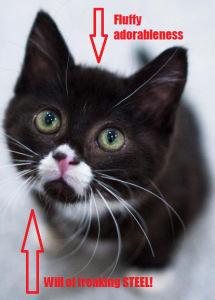 Nope, being the little bada*s that he is, he screamed (okay hissed) “FU*K you bad luck!” And instead survived for NINE weeks in the freaking wilds-of-wherever until he was rescued. He desperately fought to live while his tiny little stumps became infected and he slowly began to starve. That’s right, there’s a will of steel hiding underneath that coat of cuddly kitten fur. And now that Cassidy has recovered from his ordeal he is ready to roll… literally. 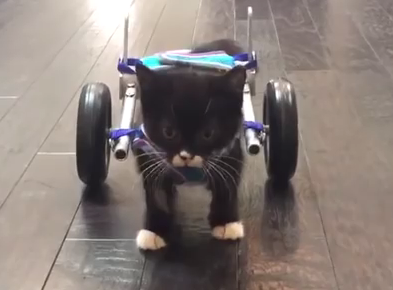 Watch… and maybe weep just a little bit… as this little miracle furbaby takes his first unassisted steps in his custom wheelchair. Oh, and after you watch head over to tinykittens.com to watch Cassidy and his kitten friends all freaking day long! Yes, there IS a heaven. You’re welcome. Next Post Inside cat says, “Holy Sh*t is THIS the OUTSIDE they always speak of?! ?